Byregina: Want to read my guest post by byregina.com? It’s all about using Asana to manage your projects and clients. Head this way to read it! 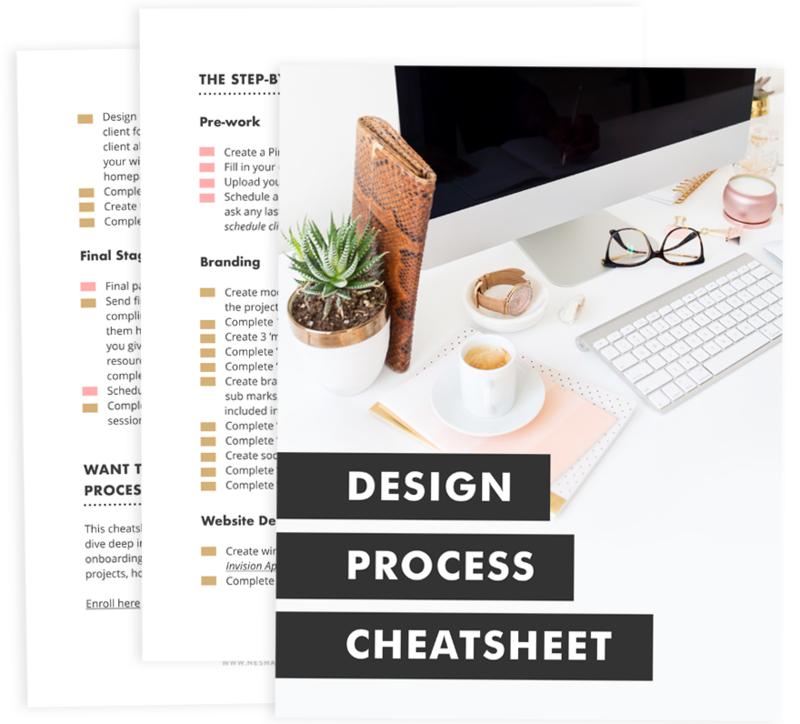 Organize & Automate: Learn how to streamline your design process with my signature course! My most popular post published in July: Should you switch from freelancing to selling products? My top 3 traffic referrers: Direct, Pinterest, Twitter. This month, I’ve focused more on my website design than my traffic. I wanted to make sure that my site was converting as much as possible, so I spent some time working on a slightly different layout. - Added an opt-in to the banner image on my homepage. - Made sure that my footer, banner and header opt-ins are all different. If a visitor isn’t interested in the first opt-in, they might be interested in the second or third! - I linked my three homepage icons to my three main products. - I added a Sumome share widget to the left side of my website. I’ve already started seeing results from these small changes! After I linked my homepage buttons to my products, I started getting regular, daily sales (as opposed to before, when there would be some days I wouldn’t sell anything). And after adding the Sumome share widget to my site, I noticed I’ve been getting more shares to Twitter, Facebook and Pinterest! I’m going to continue tweaking my website towards my core goals, so I’ll let you know how my experiments go! I spent a whole day refining my newsletter and my list system this month. I went through all the automations I’d set up in Convertkit and deleted the ones I didn’t need anymore. I set up two more sales funnels (which I’ll explain about it a sec!) and I created landing pages for my most popular opt-ins so I could cancel my Leadpages plan and just use Convertkit. There was a lot of information in that paragraph so I’ll explain! In Convertkit, an ‘automation’ is a trigger that you create. For example, when someone enrolls in my signature course, Organize & Automate, I have an automation set up in Convertkit that tags the subscriber as ‘Enrolled in O&A’ without me having to do anything. That way, I can keep track of exactly who is enrolled in my course and I can easily contact my students. - When someone signs up for a lead magnet related to your service, you could tag them as ‘Interested in my services’. Then you can easily send seperate, targeted emails to this group of people you know are definitely interested in your services. - When someone clicks the link to your course sales page from your email, you can create an automation that tags everyone who clicks the link as ‘Interested in my course’. Then you can send these people more targeted emails because you know they’re more interested than the rest of your list. Automations lighten the amount of work you have to do with your email list. - When someone signs up for it, they’ll immediately receive an email with the link to the video class and some info about me. - I created an automation that then automatically adds the subscriber to an email series that has about 5 emails in it. Over the next 5 days, the subscriber receives those emails. Most of the emails are helpful and provide the subscriber with even more free goodies, but I also tell them about my course, share testimonials, and help them see how Organize & Automate would be a great next step to the video class they watched. Sales funnels like these are really easy to set up in Convertkit. Once you’ve set them up, they start converting subscribers into course students while you sleep! But more importantly than that: they help your subscriber become familiar with you and see you as the pro that you are. Guys, I really don’t know what to say about Leadpages. It’s a good tool, but I don’t feel like I’m utilizing it to its best ability. I mainly use Leadpages to create opt-in pages and boxes, but Convertkit can do the same thing. That’s why I spent some time deleting all the Leadboxes from my site and replacing them with Convertkit boxes. Unless I’m going to fully use Leadpages, I don’t see the point in sticking with it. I decided I wanted to go abroad and do more volunteer work, so that’s what I’m doing! To prepare my business for that, I spent most of this month writing and scheduling blog posts, setting up sales funnels, and doing everything else I could to make sure that my business runs smoothly while I’m away. I’ll still be working while I’m away (which includes chatting with you lovely ladies on Facebook! ), but I want to make sure that I’m as prepared as possible. After all, most of my time will be spent on volunteer work out there! Host my first group coaching call. As part of the special bundle I offered last month while prelaunching my course, Organize & Automate, I included a group coaching call. I’ll be hosting it next month and I can’t wait! It’s going to be so much fun answering everyone’s questions and helping my students streamline their design process. Continue prepping my business for my adventure in Nicaragua at the end of the year. There’s a LOT of prep work to do, but it’s all for a good cause. Derek Halpern. I’m really into Derek right now. I don’t remember how I found him or when I even opted into his list, but his newsletters started coming through last month and I got hooooooked. Sign up- you won’t regret it. Pintastic Profit: A free course by our very own she lancer, Summer! Her free course is packed with SO much good advice on using Pinterest to grow your blog and business. Check it out! Acuity Scheduling: I’m in the process of switching from Calendal to Acuity Scheduling for scheduling all my client calls. If you sell coaching sessions like I do, it allows your clients to pay for the session and schedule it from the same page. It beats my current process! Disclaimer/Truth: I do earn a commission if you purchase any of the products with an * next to them. There are obviously other products available like these, but these are products I love and they are my recommendations based on my own experience. If you do purchase through my affiliate link, thanks so much for your support! This lesson wasn’t about tools and resources, it was about good old fashioned advice! So instead of leaving links to resources here for you, I want to remind you to stay respectful when you’re collaborating with other creatives. Create and sign a contract, stick to boundaries, communicate in a timely manner and you should be fine!